This IBM® Redguide™ describes one of the most significant challenges in healthcare today: the need for healthcare providers to effect patient care positively and proactively in the face of increasing patient load and information overload. However, the healthcare industry has been slow to embrace information technology (IT) solutions that can optimize clinical and administrative processes and, therefore, maximize the cost-effectiveness of care. The sluggish healthcare industry adoption of IT is attributable in large measure to the unavailability or inadequacy of IT tools for use at the point of care (POC). Such tools can enable user-friendly, complete, accurate, and timely clinical decision support, inherent in which is the real-time contribution to the medical common body of knowledge (CBOK). IBM WebSphere® business process management (BPM) powered by smart service-oriented architecture (SOA), or BPM powered by Smart SOA, has the potential to maintain the increasing CBOK. It also makes critical, current data available to practitioners in a manner that is consistent with the evidence-based, event-driven environment to which healthcare aspires. 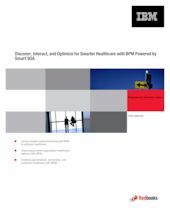 BPM powered by Smart SOA can also automate healthcare provider administrative and care delivery processes to optimize enterprise operations and to maximize the safety and success of patient care.